I was worried that Rogue One, the first of many planned big cinematic Star Wars spinoffs, would be overshadowed by last year’s The Force Awakens. J.J. Abrams served up an uncomplicated movie that moved the Skywalker story foward. It was a safe and satisfying reboot, and got people excited for what’s to come. The task given to director Gareth Edwards was decidedly more daunting. Not only was he under pressure to deliver the first spinoff, he had to tell a story with an outcome most people are already familiar with. Star Wars fans know the Death Star plans were stolen—it says as much in the opening crawl of A New Hope. Yet, the director handles it with remarkable care and attention to detail. Rogue One is the perfect way to kick off Disney’s Star Wars Anthology series, which will also include a Han Solo film starring Alden Ehrenreich. Rogue One’s greatest achievement is that it succeeds at feeling like its own kind of Star Wars movie, one that’s gritty and violent and full of struggle. Whereas The Force Awakens was meant to resemble the original trilogy created by George Lucas, Rogue One feels separate, capable of telling its own narrative without relying on anything before it. There’s death and destruction, and when the team successfully delivers the plans, it feels earned. The setup is simple: Jyn Erso is asked by the Rebels to help get information on the Death Star, a planet-killing weapon that her father helped build. We find out, however, that he did so not because he believes in the Empire’s cause, but so he could sabotage the project. When Jyn figures this out, it gives her motivation to fight for something bigger than herself. And you want like hell for her to succeed. Once Rogue One’s central conflict kicks into high gear, the movie moves at a brisk pace and rarely lets up. After Jyn agrees to help the Rebels, we’re introduced to a number of new characters, each with their own distinct personalities and quirks. Casian Andor (Diego Luna) is a Rebel fighter who has been faithful to the cause since he was a young boy. K-2SO (Alan Tudyk), meanwhile, is a reprogrammed droid with a dry sense of humor. What helps give Rogue One its distinct personality is its authenticity, putting the “war” in Star Wars. The movie is intense and dangerous, giving it a gritty realness we haven’t seen from a Star Wars movie. Everywhere you turn there’s imagery meant to impress upon the audience one message: War is hell. People die, they do terrible things—and for what? Power. All films in the Star Wars franchise, even The Force Awakens, have told this message but Rogue One is the most blunt. (There was a trailer for Christopher Nolan’s Dunkirk before Rogue One started; the two movies, arguably, are a lot alike.) In other Star Wars films, the action can sometimes feel too manufactured, which means the characters never feel like they’re in any real danger. You know that good will always trump evil. In Rogue One, however, the stakes are such that anyone can die at any moment. While the film is about the Death Star plans, Rogue One is very much Jyn’s movie. She has a drive and motivation that you can’t help but root for and when things seem dire she’s up for the challenge. Jyn never loses hope even when the odds aren’t in her favor. Her right hand man, so to speak, is Cassian Andor, who exists in a grey area as far as Star Wars characters are concerned. While he’s committed to their cause he’s not afraid to act questionably, although he later comes to realize that maybe the decisions he’s made throughout his life were never for himself but for the Rebellion. This gives him an arc that comes to a fitting and satisfying conclusion. 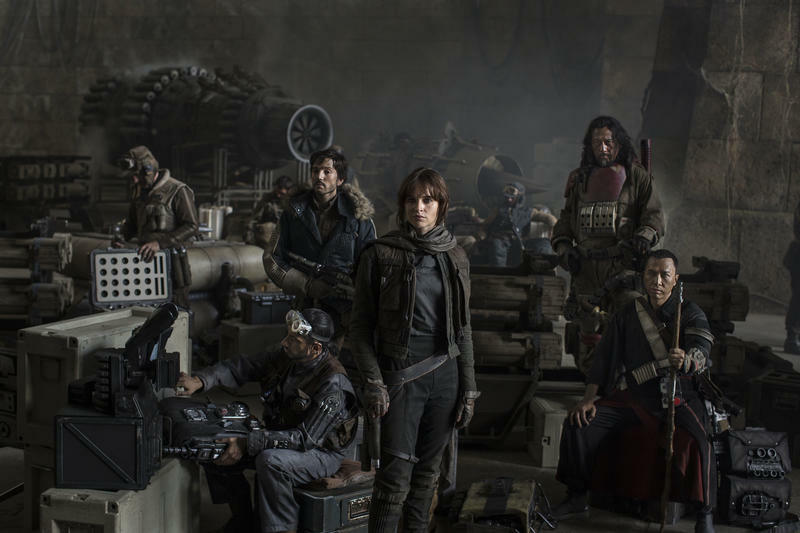 The other characters joining Jyn’s team includes Chirrut Imwe (Donnie Yen), Baze Malbus (Wen Jiang) and Bodhi Rook (Riz Ahmed), the latter of whom is an Imperial pilot who defects to the Rebels. They all have roles to play and contribute in important ways, never feeling like they’ve been shoehorned in for the sake of the film. Donnie Yen’s Chirrut Imwe in particular is a highlight. He’s not Force sensitive yet he believes wholeheartedly in its existence. What’s remarkable is that even though we know where Gareth Edwards is taking us it never matters. The film unfolds in exciting ways and there’s tension at every turn. Near the end, there’s a scene with Darth Vader that had me on the edge of my seat. I was impressed with how Edwards was able to infuse so much suspense into every scene. Complementing the film’s violence and action are the gorgeous visuals. Edwards takes audiences to a lot of beautiful locations—some familiar, some new—including Scarif, a tropical paradise where the Empire keeps the Death Star plans. Everywhere we go feels like a believable and lived in world—a place maybe Han Solo might have passed through at some point. Even when the Death Star tests its weapon you can’t help but look on in awe. Perhaps the weakest part of the film is Director Orson Krennic (Ben Mendelsohn), who overseas the Death Star project. While Mendelsohn is a fantastically gifted actor, Krennic as a character never feels particularly threatening, and he’s pretty one dimensional. He simply wants to complete the Death Star in order to receive the approval of the Emperor. We don’t really know why he’s turned to fight for the Empire in the first place. While Krennic’s villain feels weak, Darth Vader’s presence is anything but. He doesn’t have a major role but he steals every scene he’s in, and there’s something at the end that will be a particular delight for fans. I wish I could talk about it but I don’t want to spoil anything if you haven’t seen the movie yet. Let’s just say that he isn’t relegated to standing around and looking ominous. For a lot of Star Wars fans, Rogue One is exactly the type of film they’ve been asking for for years. It’s intense, it’s gritty, it’s violent, and it isn’t afraid to show what kind of effect the war is having on the people around the galaxy. It tears communities apart, makes people do questionable things, and devastates families. Although you know what happens in Rogue One, the film unfolds in an incredibly satisfying way. Every frame is packed with so much detail that Star Wars fans will geek out at every Easter Egg. And when Jyn and her team eventually acquire the plans, you’ll shout with excitement. Rogue One is very different from the Star Wars movies that came before it, and that’s a very good thing.